I am about to become the proud owner of a new puppy her mother is a working gun dog what I could do with some help with is how do you introduce a dog to gun fire I have seen people bring dogs to clay grounds and the dogs were terrified so how do you introduce them to the sound of gun fire. Thanks in advance. Starter pistol at a distance, eventually getting closer over time. Get someone to fire the pistol while playing with the pup giving it lots of attention, I cannot think of a worse thing to do than to take the dog to a clay shoot to start it off. If you don't have anyone to fire the pistol stuff it in a game bag behind your back. You are a few months away from doing it yet. What pup are you having? If you want to go back a step and get them used to loud noises, you can just start by clapping your hands etc. We used to do it at feeding time with the puppies. Get's them used to sudden noises. Maybe drop a metal dog bowl, just so they get used to the noise and it becomes almost `normal` background noise. We then would take them out for a walk, clap hands and then eventually have someone with a .22 starter pistol about 100 yards away. Fire a shot, ensure dog ok. If dog ok you make the gap smaller and repeat but don't do too much too soon. .22 is more of a crack and a shotgun is louder/deeper. That can be introduced when you are happy the dog is fine with noise (start at distance again). A lof of people tie that in with using dummies so the dog associates the shot with a retrieve. Everyone does things differently of course. My only guidance would be don't overwhelm them and do to much too soon. My lab is fine with gunshot but hates gas guns! Pretty good advice from hedge but may I add a few points from 40 years of training dogs. gunshot to me is a No, until around 12 months when the ears are fully developed. Don’t use starting pistols or dummy launchers as some dogs react badly to the crack. Do go along to a clay ground but find a big one where you can sit in the car park at least a hundred yards away and on a quiet day. Assuming you can sit on the tailgate with the dog reassuring and gauging reaction do it and feed the odd treat. If the dog shows any sign of nerves go home. If not put the dog on a lead and start to walk nearer, feed the odd treat after a shot and watch for reaction. Anything adverse back to the car and go home until another time. As long as all goes well just slowly move closer but do not expect to get right up to a gun first time out. I have never had a problem with this and the alternative is do it with a mate shooting if you do not have a suitable claygound. second point, it is not all about shot. Just waving a gun around can upset some dogs. From 6 months use a walking stick occasionally waving it about over the dog and get the dog used to it being carried generally. good luck and take it’s steady. A lot of people will say how young their dog was when it heard a shot, they rarely say how many have been ruined by too much too soon. Cracking advice. I failed to mention age limits due to not reallly remembering what they were (we just did it when we felt it was appropriate). As Dave says, some people want to rush things and/or show off about what their pup has achieved at a young age. Like children, dogs have different personalities, learning curves and ability to absorb information. Don't feel pressured into doing too much too soon. Go at their pace, not yours. Enjoy them being a puppy before you try to do anything too advanced. Look forward to seeing a photo. Are we talking lab or spaniel or something else? we take our dogs out at around 12 months, while my wife is distracting the dog with hunting or retrieving - fun tasks, I'll fire my .410 away from the dog at about 50 yards. Ours haven't reacted badly to this, they get plenty of praise when I fire, I might fire three shots on the first outing then call it a day. We'll step it up a little next time, there's no rush. We start with a starter pistol inside a game bag at a distance, possibly about 100m to begin with. We have a slightly different ethos though, we don’t just want the dog to put up with the sound, we want our dogs to associate the bangs with something positive! So, as soon as the shot is sounded the other person with the dog immediately wangs a retrieve and lets the dog run in. It doesn’t take them long to not only tolerate gunshot but have positive associations with it. It works sooooo much better than just exposing the dog to shot with nothing in it for them or nothing else to concentrate on at that very moment. Steadiness can be introduced or reintroduced later. As others have said, banging and clanging of food bowls is great to begin with as they associate it with food. PS BB would still love that photo please just let me know how much. Some good advice here, just don’t rush it. This is certainly another way of doing it with positive reward. I train labs for picking up only and for me allowing a behaviour, running in, that I then have to train out out adds another step to training that can be avoided. I do not allow my dogs to associate a shot with a retrieve, but do give treats and praise, for this reason, although I used to. When my dogs go into the field at two years or so they are completely relaxed about gunfire and not wound up looking for a retrieve. 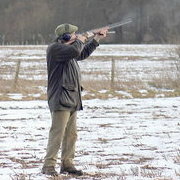 As we often stand in the line as pickers up the dogs have to watch a lot of birds fall without necessarily a retrieve. They cotton on pretty quickly to it when they have had a few days picking up but I don’t have to worry about kerbing an instinct to run in. I suppose it’s about training methods for the eventual work they will do. Certainly if it works for you that is great, just another way of getting over one of the biggest hurdles and another way to skin the cat. I would take him out Foxing, with the rifle, he loves that, "bang" and he can't wait to get out of the truck and find the fox. Just get them used to loud noises, but most important thing of all is how "you" react. Start to make a fuss when a gun goes off and you will distill concern in your dog. Guns going off are a natural sound to your "gun" dog. Don't rush into it, you could end up with a gun shy dog. 100% dustbin lids anything which will make a sudden noise and be ready to give calming help, make it fun, right from day one and I have never had a gunshy dog a dozen of them if I've counted right. Yet had two which would cower in the corner at the slightest hint of thunder, one of them, the best gundog I will ever own could sense a thunderstorm way before we could but would stalk with me and stand behind calmly whilst I took a shot... in those days no moderators. We used to say "pub train 'em" basically introduce them to all sorts of noises and situations. Have fun. miss having a dog lay beside me right now. I'm envious. I have a dog bed in my workshop. They get used to bangs, other noises and bad language all at the same time. I used the clay-ground & car method, with a bit of variation. We drove to the ground and didn't open the car, stayed in with her and talked normally... you could already hear the guns and she was curious but not worried as we were there having a chat. Also, we were rather lucky than the neigbours were having work done and there was lots of banging about the previous few weeks. Then a bit later (another day) we did it again and cracked open a window (away from the gun) and continued staying in the car. And we gradually did this until the windows were all open, then the door, then we put her on the ground, about 50+m from a stand and she completely ignored the gunfire by then.